Companies made more than 42,000 alliances over the past decade worldwide, many of which failed to deliver strong results. This book explains why and how you can seize the benefits from your business’s network of alliances with customers, suppliers and competitors. Network Advantage shows how awareness of these three advantages can help align your portfolio of alliances with your corporate strategy to maximize advantages from existing networks and to position your business as an industry leader. This book is written by three leading authorities in the field of organizational management who work with many international corporate clients. Based on groundbreaking research and illustrative cases, it provides practical tools to help you think strategically about reconfiguring your alliances and partnerships. For business executives, consultants, and executive MBAs who want to get the most advantage from the combined power of their alliance portfolios, Network Advantage offers in-depth, practical guidance. Make it your first strategic connection to gaining competitive advantage! Companies’ connections to other firms—their network of alliances—matter for economic success. In this practical, jargon-free, evidence-based book, three experienced scholar/educators provide practical tools to understand your company’s network positioning and what to do to build webs of relationships that provide competitive advantage and economic value. —Jeffrey Pfeffer, professor, Graduate School of Business, Stanford University and co-author of The Knowing-Doing Gap. The book, Network Advantage, presents compelling ideas and is a must-read. It articulates three different perspectives to think about a firm’s network advantage and shows how a firm can maximize the value of its alliance network. The book is filled with theoretical and practical insights on the topic and offers captivating case studies to illustrate its key points. It is fun to read. I highly recommend this book. In this eminently researched book, the authors show how executives and entrepreneurs alike can unlock the value of alliances. And the book comes with some "secrets" to success that most managers overlook. Every CEO, executive and entrepreneur who are collaborating with other firms ought to read this book. —Morten T. Hansen, Professor at University of California at Berkeley, author of Collaboration and co-author of Great by Choice. Don’t compete alone! 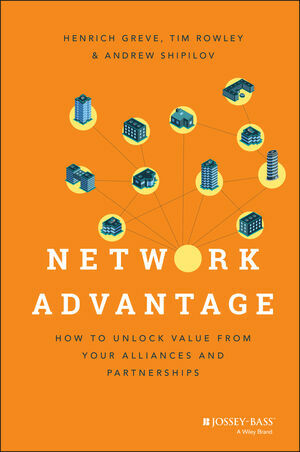 “Network Advantage” provides a fresh perspective on how all firms can benefit from their alliances and partnerships. The authors seamlessly integrate academic research and real life examples into a practical step by step guide for unleashing the power, information and cooperation advantages available in networks. A must read for thoughtful executives and entrepreneurs alike. Having the "right" business network is everything for a company's success in Asia and worldwide. With its rich cases and practical tools, this book is an indispensable guide for a thoughtful executive on how to design, build and manage a network that will make your firm globally competitive. —Yong-Kyung Lee, Former CEO of Korean Telecom, Member of the Korean National Assembly. Alliances and Partnerships, in their various formats and guises, are the bridges that allow businesses to thrive in their ecosystems by leveraging each other's strengths. The authors show how those bridges, when used appropriately, can help your firm create an alliance network to enhance your business power. The book contains many examples and models to help you shape your own alliance strategy in a world of ever increasing co-opetition. Henrich Greve is a Professor of Entrepreneurship and the INSEAD Chair of Organization and Management Theory. He holds a Ph.D. in Business Administration from Stanford University Graduate School of Business. He does research on organizational networks and learning, and he teaches strategy and organizational change for executives at the Singapore campus of INSEAD. Tim Rowley is a Professor of Strategy and Organizations at the Rotman School of Management, University of Toronto. He teaches courses on competitive advantage and corporate governance, and his research is focused on how organizations are influenced by the network of relationships surrounding them. Andrew Shipilov is Associate Professor of Strategy and Akzo Nobel Fellow at INSEAD. His research and teaching revolve around networks, innovation and competitive advantage. He holds a Ph.D. from the University of Toronto, Rotman School of Management.